Darrell J Stewart drove to victory at I-25 Speedway last weekend and kept his excellent driving streak going by winning the feature race at Big Country Speedway. The Wildlife Racing team is putting some miles on their trailer early this season and it is paying off for them. Pushing Darrell to the checkered flag were Scotty Scott, Corey Seip, Nick Cooper and DL Stewart. I was told that it was a great night at the track with sixteen cars on hand. I did switch weekends with Jacob Hough late Saturday morning and he helped out with the Raceceiver that evening. Also a big thanks to Carol Adkison with her promotions as a sponsor for the RMLRA this season. 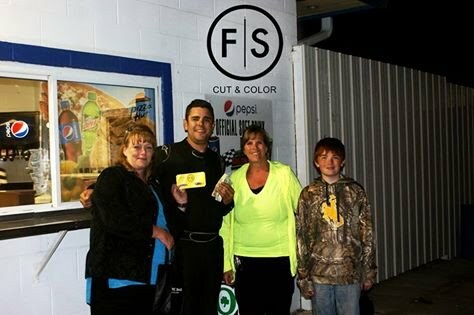 Fantastic Sam’s Hair Salons have come aboard as a major sponsor for racing at Big Country Speedway. Need a hair cut, patronize our sponsors and tell them you heard about them at Big Country Speedway in Cheyenne. Thanks to all of you who made the trip to race in Cheyenne. Roy Dunlap #62, Dean Kallas #33 made their season debut. Rain is moving into the area later this week but the RMLRA does return this Saturday evening for races at Big Country Speedway, May20th. Looking forward to seeing you at the tracks if you can make it. Unofficial Results from Feature race.